There is an old Polish saying, “Wherever there is a priest, a church, wherever a parish is being created –there Polish life grows vigorously.” In 1909 in Erie Pennsylvania, the population was to be 66,525 the following year. Within that statistic was Erie’s "Polonia” (the term used for any community of Poles outside Poland.) Erie’s “Polonia” had two parishes, Saint Stanislaus (1883) and Holy Trinity (1903). The need was quite evident for another parish. Reverend Andrew Ignasiak, Pastor of Saint Stanislaus, and a chosen committee prepared for the foundation of Saint Hedwig Parish to be situated on the southeast corner of East 3rd and Wallace Streets. The founding members where: Alexander Poswiatowski, Stanislaus Kopkowski, Alexander Donikowski, John Mikolajczak, Sophie Niedzwiecki, Ignatius Smykowski, Alexander Kaminski, Vincent Sutula, Alexander Buziewicz, Casimir Nowak, Matthew Krzywicki, Boleslaus Szymanowski, Adam Runiewicz, Vincent Trochanowicz, Anna Luczynski, Vincent Arasimowicz, Vincent Groblewski, Michael Arasimowicz, Michael Stryzynski, Hypolit Przybycin, Francis Trochanowicz, Sylvester Bernatowicz, Bernard Donikowski, John Ostrowski, Alexander Dyminski, Adam Kieklak, John Kieklak, Joseph Budajtis, Joseph Wozniak, Joseph Dombrowski, Ladislaus Witkowski, John Plonski, Anthony Mazanowski, Stanislaus Dumala, Francis Waraksa, Anthony Nitczynski, Francis Czaroryski, Alexander Baniszewski, Joseph Sosnowski, Anthony Krauczunas, Stanislaus Komasa, Stanislaus Paczynski, Stanislaus Wnukowski, Maciej Krym; also, Paul and Agnes Shimek, John and Mary Kralik, Joseph and Constance Rutecki, Adam and Mary Pastewka, Valentine and Magdalene Pastewka, Thomas and Anna Zdunski, Francis and Victoria Buszek, Dominic and Amelia Jarzomski, John and Natalia Niedzwiecki, and Mr. and Mrs. Wisniewski. The property on which Saint Hedwig’s buildings stand originally belonged to Elizabeth F. Denny. After her death it was willed to her daughter, Amelia Melisina Brereton, from whom on October 1, 1909, one part of the estate was purchased for the construction of the church. Postcard of the first Saint Hedwig Church and school built in 1911. To the left is the first rectory (later convent built in 1913. This Postcard was published by Polonia Americana Publishing Company of Chicago. The first floor of the new structure would house the two-room school, and would also be the pastor’s residence until 1913. The second floor which held 300 seats would be used for the Church. 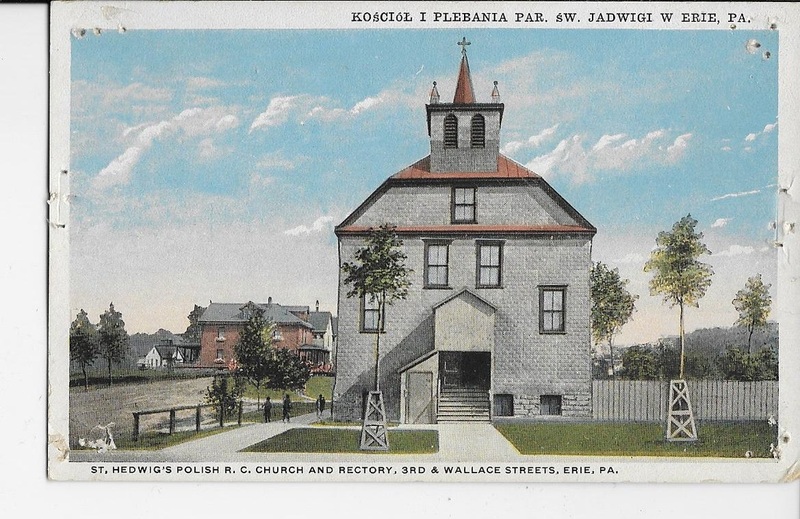 On May 3, 1911, Bishop John Fitzmaurice appointed the Reverend Franciszek (Francis) Robaczewski (who was then Pastor of St. Stanislaus Kostka in Tyler, Pennsylvania,) to become the first pastor of the newly founded parish of St. Hedwig in Erie. The first Solemn High Mass in the original church was on May 11, 1911. The first baptism for Jadwiga Czartoryski was held on May 19, 1911. The first marriage was on July 3, 1911; John Stopera to Katarzyna Ignator. On July 4, 1911 Bishop Fitzmaurice dedicated the new church. Genowefa Podurgiel was the first funeral held on July 6, 1911. The first communion class was June 21, 1912. 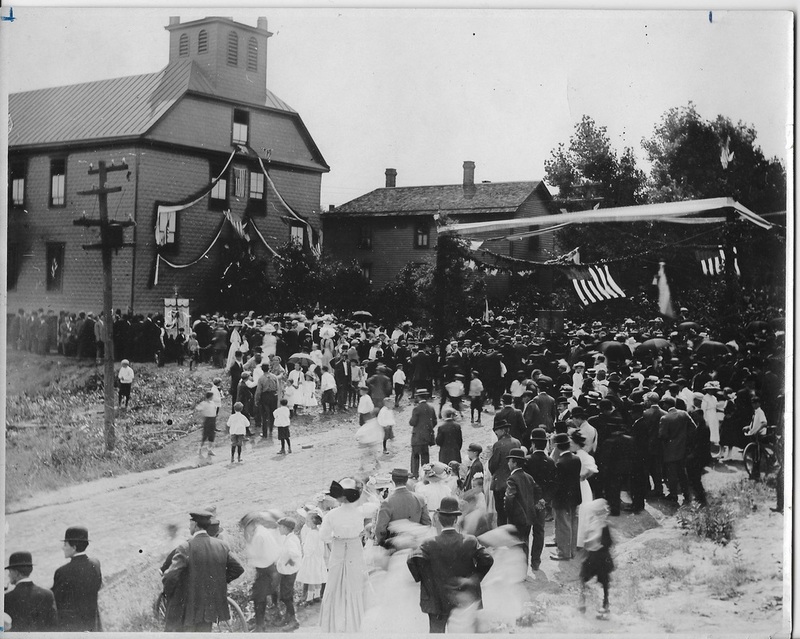 Dedication of first church July 4, 1911. The neighborhood surrounding the new St. Hedwig was called “Jadwigowo,” meaning the area or district of St. Hedwig. This shows how closely the Polish immigrants identified with their Parish. It was a part of them. In 1913, Father Robaczewski moved into the newly constructed rectory (later convent) until 1929. The school was staffed by the Felician Sisters. In 1911 and 1912, they lived at St. Stanislaus convent. After the pastor moved into his new rectory they made their first home where Father had lived on the first floor of the school building. The monthly salary for the teaching Felicians was $25.00 per month, for the ten school months they taught. Some of the duties of the Sisters were to teach the Polish and English language. They also taught the girl’s needle-work, how to wash and iron altar linens, corporals, purificators, etc. ; how to bake altar breads for communion hosts, and how to decorate and care for the altar. As the need grew for another Polish Parish, St. Casimir Church was founded in 1914. On February 26, 1915, a private home situated on the north side of Fourth Street was bought from Nellie Wick. When the sisters made this acquired home their convent, the two-room school was expanded to a seven-room school. Also in 1915, St. Hedwig celebrated its first Confirmation Class on May 16. The eighty family parish grew rapidly. By 1925, Father Robaczewski was now serving over 300 registered families and was in need of assistance. His brother, Father Michael Robaczewski, became St. Hedwig’s first assistant until his early death in 1932. By 1926, the school was too crowded and the church was becoming too small for the growing congregation. Ground on the corner of Third and Wallace streets was broken for the erection of a new church. On September 11, 1927, Bishop John Mark Gannon blessed the cornerstone of the temporary basement church at which ceremony Father Casimir Rybinski preached. Three months later, on December 23, the first Mass was celebrated in the new basement church. Here the community would worship until the superstructure would be completed in 1933. As the school expanded to eight classrooms, the teaching staff increased; the fourth street frame convent became crowded. It was necessary for the sisters to move into the third street convent occupied temporarily by the pastor and assistant. On Thanksgiving Day, 1929, Father Robaczewski moved into a newly constructed three story rectory. In the following weeks, the sisters moved into the sixteen year old convent. The year 1929 also marked the stock market crash and the beginning of the depression. Since a great majority of the parishioners were laborers they were among the first to feel the effects of the depression. Against all odds, Father Robaczewski was determined to complete the new church. The good priest looked to find ways to make the building process economically feasible. The people of Saint Hedwig’s freely offered themselves to work on the building. The pennies and nickels of these parishioners grew into hundreds of dollars! The cobblestones were obtained from the city of Erie at no cost. They came from the old city streets which were being torn up to make way for modern paved roads. On The Feast of the Assumption, August 15, 1933, a contract was signed to build the new church. It was completed the following year. According to the Lake Shore Visitor, “The completed edifice is a thing of beauty. The exterior is a combination of deep tapestry stone, comprising the colors of deep brown, brownish gray, yellowish gray, and gray trimmed with Indiana limestone of the yellowish cast. This combination of colors and textures makes every foot of the building a spot of interest.” “The roof is a sea of green slate and copper for the flat surfaces of the steeple being constructed of the same color combinations as the main body of the church. The weathering copper which turns to bright greens in the weather, together with sea-green slate roof, gives the building a touch of life, warmth, and color.” “The design of the building is of English Gothic semi-cathedral type, having a clere story, towers etc.” “All aisles, vestibule, and sanctuary are of terrazzo in deep colors and patterns.” “The high altar itself is one large marble altar as though it was hewn out of the mountains solid with rounded edges.” The tapestry behind the tabernacle depicts fourteen Polish saints. St. Hedwig is shown with a crown on her head as she was truly a Queen. 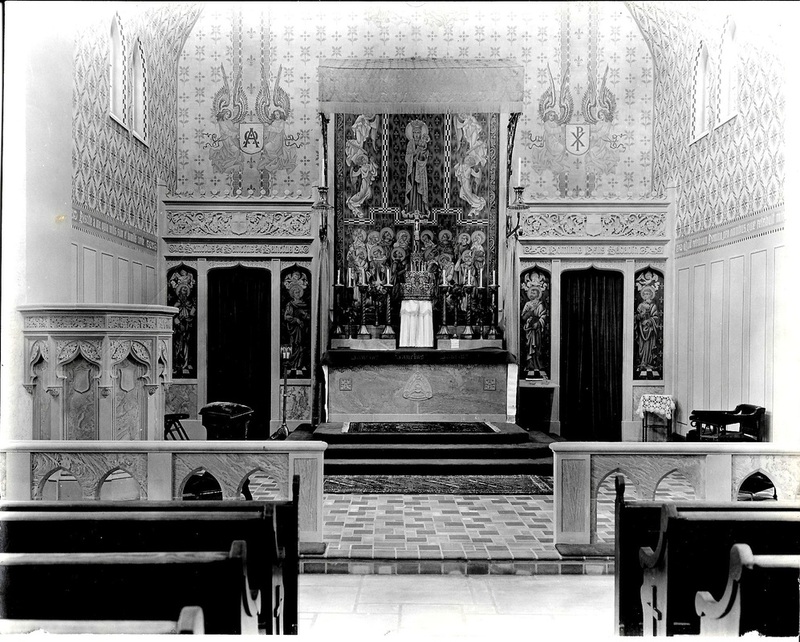 The blessing and dedication ceremonies of the new church took place on July 15, 1934. All of Erie Polonia took part. Bishop Gannon was met by members of the various Polish societies on East 6th and Wallace streets at 9:30 AM to parade him to the rectory. 1. Various organizations in uniform between 9th and 10th. 2. All organizations and societies from Saint Stanislaus between 8th and 9th Wallace. 3. Between 9th and 10th clubs of Polish Merchants and businessmen. 4. Holy Trinity 7th and 8th. 5. Societies Holy Family (Slovak) 6th and 7th. 6. Saint Casimir’s 5th and 6th. 7. Saint Hedwig Societies between 4th and 5th. 8. Polish Falcons Band Nest 123, 9th and Wallace. 9. Polish Vets Szumigula Post 17, 7th and Wallace. 10. Band Ignace Chojnacki (Kanty,) 4th and Wallace. Marshalls are S. Domowicz, A. Mikolaczyk, F. Malinowski, W. Lada, P. Borowy, Laniewicz, F. Kaminski, J. Urbanski, J. Konopka, A. Konopka, E. Lada and W. Malinowska. 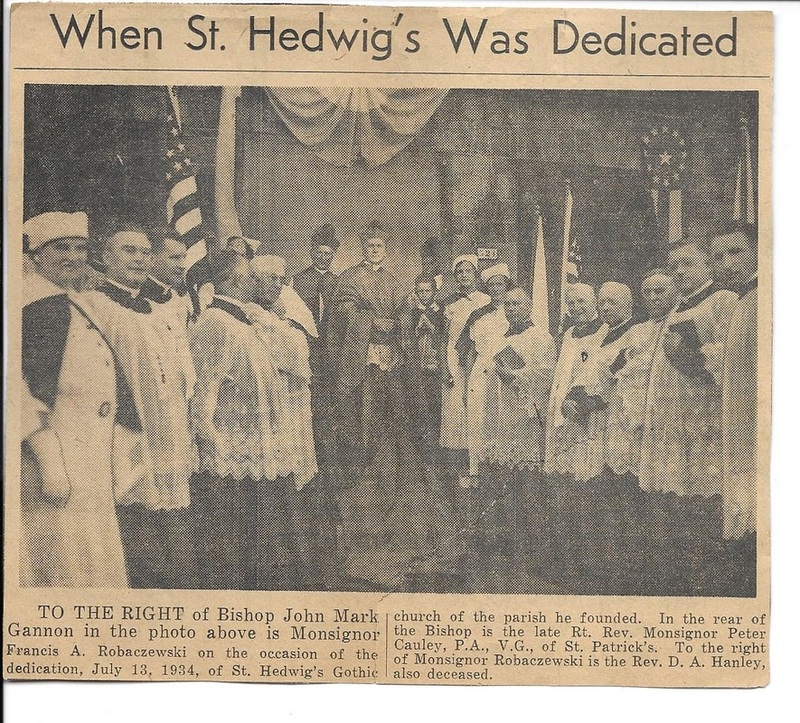 According the Lake Shore Visitor, “Thousands of parishioners and friends of St. Hedwig witnessed the impressive ceremonies. Promptly at 10 a.m. the Bishop made his was in solemn procession to the new church. He was preceded by the thurifer, cross bearer, and acolytes, holy water bearer, altar boys and the clergy according to rank.” “The exterior of the edifice was blessed by the Bishop, after which the clergy chanted the litany of the saints. After this, the Bishop blessed the interior walls.” A Pontifical Mass followed celebrated by the Bishop Gannon and assisted by the Reverend Stephen H. Cauley, of St. Patrick’s Church, presbyter assistant. The deacons of honor were the Reverends S. E. Niedbalski and Steven W. Dlugolecki; Reverend John L. Mieczkowski was deacon of the Mass and Reverend Peter Olszowska C.M. was the sub-deacon. The Very Reverend Msgr. R. T. Guilfoyle and Mr. Alois Wilczewski were masters of ceremonies, and the sermon was preached by the Reverend Casimir T. Rybinski, of St. Michael’s Church, DuBois. “The following were present in the sanctuary: the Rt. Rev. Msgr. A. Ignasiak, the Rt. Rev. Msgr. Peter Cauley, the Rt. Rev. F. Kasprzak of Buffalo, the Rt. Rev. J. Gulez of Wilmington, Delaware; and the Revs. F. Robaczewski, Pastor of St. Hedwig’s, P. Paunder of Girard, D. A. Hanley of Girard, C. Krazyzan of Buffalo; M. Schamberger, D.S. Sheehan, and J. Lubeszczyk. The Revs. E. J. Fischer, J. L. Hurley, B. Nieslony of Kanty College, F. J. Carrick, C. H. Cooper, J. Jurcak, and L. Marino.” “At the conclusion of the Mass the Bishop addressed the people, complimenting the parishioners and congratulated the Pastor. Ceremonies were concluded with a procession to the rectory.” The European stained glass windows were created by Joseph Herzig of Munich, Germany, whose inscription can be found on the lower left hand corner of some of the windows. The windows, which give off great illumination, are like a parish history lesson in itself. You can see the names of many parishioners and societies who donated their hard earned dollars so that they could be a part of their church. The lower windows depict the saints (mostly Polish) while the upper windows are of the Ten Commandments. The procession of angels and archangels in the vault of the ceiling were hand painted using the features of the children of the parish as models. In 1938, Father Louis Kozlowski was named assistant to Father Robaczewski, shortly after his ordination to the priesthood. In recognition of his continual zealous service to Holy Mother the Church, Pope Pius X11 elevated Father Robaczewski to the rank and dignity of Right Reverend Monsignor on December 12, 1943. On January 23, 1944, the public honored the Monsignor at a testimonial in recognition of his services to St. Hedwig’s. Four years later, on the evening of Saturday, February 21, 1948, Monsignor suffered a cerebral hemorrhage. The following morning the beloved pastor died. Four days later, February 26, his brother, Father Anthony Robaczewski, offered the funeral Mass. Monsignor Stephen Cauley, who said of Monsignor, “In all the years I knew him, I never heard him say one disparaging thing about his fellow man.” The remains of Monsignor Francis Robaczewski were laid to rest at Calvary cemetery. From February to May 17, 1948, Father Kozlowski served as administrator. 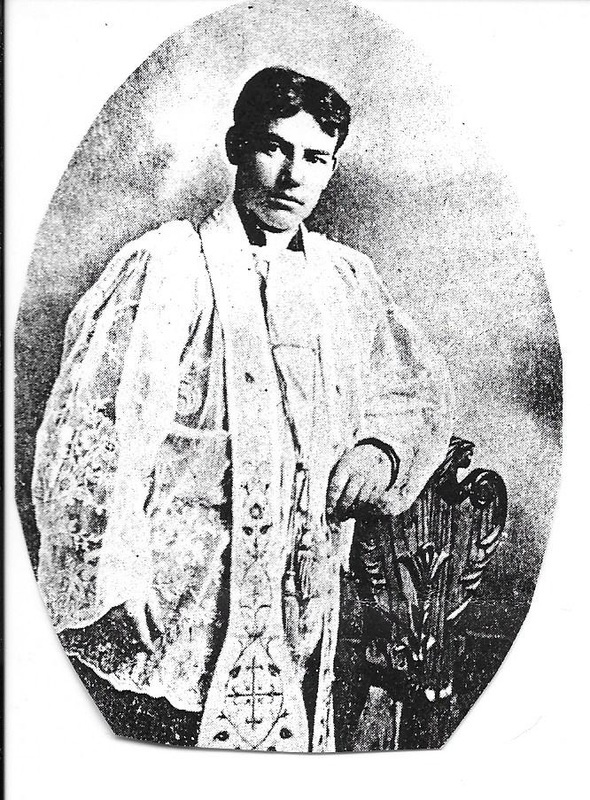 Reverend Joseph J. Cebelinski then took over the parish. He was previously an assistant at Holy Trinity Church. Father Cebelinski was assisted by Father Anthony J. Nowakowski, a native son of St. Hedwig. The original school building continued to age; though once functional, it was becoming obsolete. Father Cebelinski prepared for the raising of funds for a modern school building in 1955. 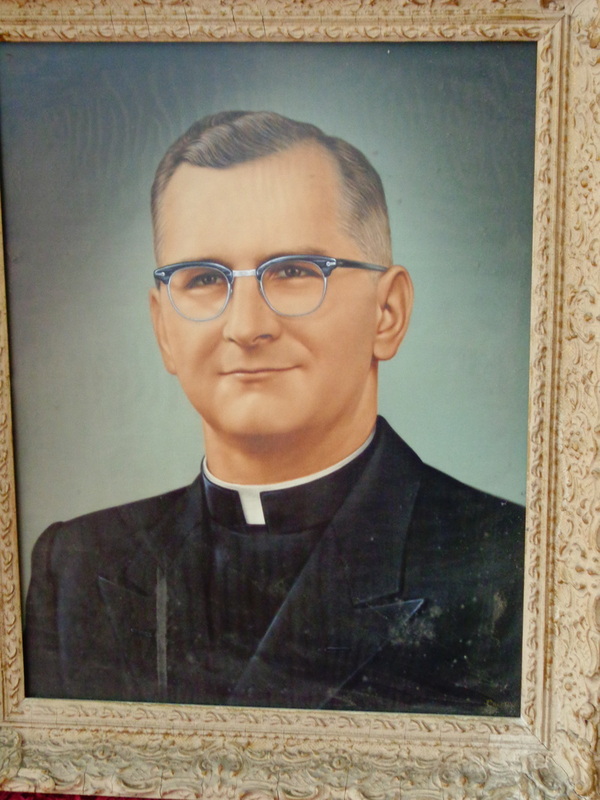 In November, 1959, Father Louis Kozlowski was appointed pastor of St. Hedwig’s. Father immediately continued the fund raising program with the aid of the School Building Committee. On September 25, 1960, Father Kozlowski broke ground for the new school in a formal ceremony at which were present: Rev. Joseph Cebelinski, Pastor of Holy Trinity Church, Rev. Martin Cymbrowski, C.M., Rev. Joseph Kacprowicz, Pastor of Assumption Church, Oil City, Rev. John Daniszewski, Assistant Headmaster of Cathedral Prep; Rev. Dr. Edward Gicewicz, C.M., and Rev. Joseph Radziszewski, Pastor of St. Anthony’s, Cambridge Springs, preached the sermon. On March 14, the final plans drawn by the Architectural Firm of Richard Weibel and Associate, Norbert Rydzewski, were approved by the Pastor and Building Committee. The contracts for the construction work were signed May 3, 1961. The contracts were awarded as follows: General Construction, H. Platt Company; Heating and Plumbing. Wm. GT. Spaeder-Company; Electrical Contract, Kahkwa Electric Company; Demolition of Old School, Peter Kaschak. On May 8, 1961, the old wooden eight room school was demolished. The new school opened its doors in September of 1961. In April of 1961, Father Edward Bula was appointed as assistant to St. Hedwig Parish. On November 26, 1961, St. Hedwig celebrated its Golden Jubilee with a Solemn High Mass. Also on this day, the new school was blessed by Archbishop Gannon. The Golden Jubilee festivities continued at the grand banquet held at the Third Street Polish Falcons Nest 610. The Second Vatican Council brought several changes to St. Hedwig Parish. For the first time, the priest said the Mass in Polish and English, instead of Latin, and now faced the people. Mass was said on a new portable altar. In 1965, the parish started its lay ministry program with the introduction of lectors. The spring of 1970 saw Father Thaddeus Kondzielski become the parish’s new resident priest. The Parish, in October 1978, was elated to learn of the election of Cardinal Karol Wojtyla; the first Polish Pope. The election was on the feast of St. Hedwig, when the parish was closing its novena. At about the same time, renovations were made to the Church’s Sanctuary. They included a new permanent altar dedicated to Pope John Paul ll, new lecterns and carpeting. Parishioners were saddened in June of the 1984, by the closing of the grade school. The decision was made by Father Kozlowski and the Parish School Board because of declining enrollment. On June 22, 1985 the first Eucharistic Ministers were installed in the parish. Monsignor Joseph Wardanski was appointed the new Pastor. However, because of this numerous duties for the Diocese and Chaplain of St. Mary’s Home, he stepped aside after only one year. 1987. He enjoyed and participated in the Polish customs and hymns. He was also responsible for the restoration of the beautiful Our Lady of Częstochowa Icon in 1993. Monsignor retired in 1998 due to health reasons. Father William Sutherland was named the new Pastor of St. Hedwig as well as St. Patrick Church. However, Monsignor Lawrence Brandt was named resident administrator of St. Hedwig in 1998 to relieve Father Sutherland of the overload of tending to two parishes. Monsignor Brandt was responsible for putting Saint Hedwig on the Diocesan list of Churches to be toured. He was appointed Bishop of the Greensburg Diocese in 2004. Father Sutherland now assumed full duties as Pastor of both St. Hedwig and St. Patrick’s. He was also responsible for the restoration of the Saint Hedwig Statue as well as the requisition of a relic of Saint Hedwig. During Father Sutherland’s tenure several priests were sacramental assistants including Father Michael Allison, Father Daniel Prez, Father Regis Meenihan, and Father John Santor. Father Sutherland was transferred to Edinboro in 2009. Since 2009, Monsignor Henry Kreigel has been Pastor of St. Hedwig and St. Patrick’s. Native son, Father John Santor, presides over Saturday evening masses. In 2011, Saint Hedwig Church celebrated its 100th Anniversary with a special mass and dinner on October 16, the feast of Saint Hedwig. Sources: Jubilee books 1961, 1986, 2011. Trybuna Polska, Lake Shore Visitor. After months of study, the Bishop cited diminishing membership of St. Hedwig Church and the absence of a full-time pastor for nearly twenty years. The Parish greatly declined during the Pastorship of Msgr. Henry Kriegel who was also Pastor of St. Patrick Church. The preliminary Pastoral Plan was to merge St. Hedwig Church into Our Mother of Sorrows Parish, which already consisted of St. Casimir, St. Ann, and Holy Family Churches. The input received from the Pastors and St. Hedwig parishioners themselves was to go with St. Stanislaus Parish, to better enable St. Hedwig’s to survive and keep some of their Polish traditions. Due to the Pastoral Planning Process in the Erie Diocese, St. Hedwig Church was merged into St. Stanislaus Church effective February 13, 2017. 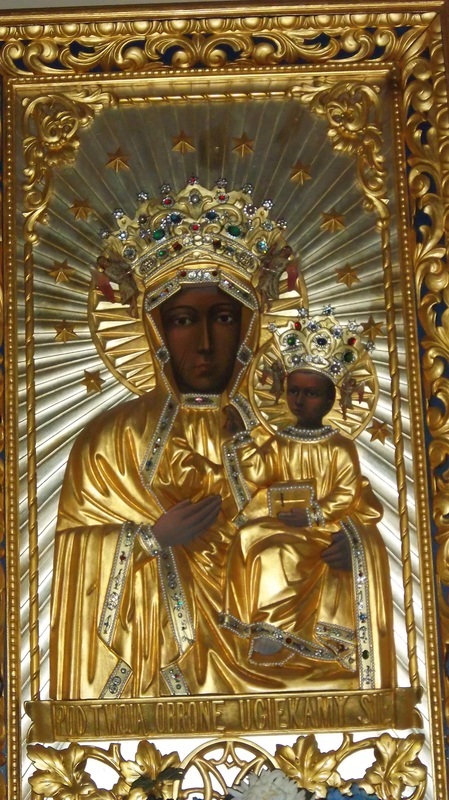 Our Lady of Częstochowa, watching over Saint Hedwig’s Parish yesterday, today and tomorrow!